2-hole dartboards have the official tournament and tournament dimensions on the dart. The 2-hole dartboards on the Double and Triple segments allow you to train with the official skills you would expect at dart machines made by well-known manufacturers such as Mercury or Lloyd Dart are valid. 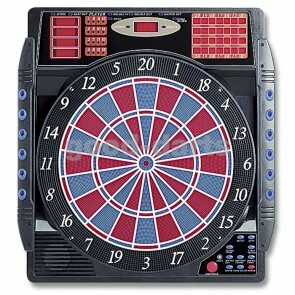 Why the electronic dartboard 2-hole is the professional choice can be explained fairly easily. The darts of Merkur and Leuven in the many pubs are the standard in most tournaments and league operation of the German darter scene. These dart machines have the double and triple segments a 2-hole distance. Electronic dartboards with more than 2 holes in the Double and Tripple segments are rather cheaper variants and do not correspond to the official dimensions and specifications of the German Dart bandage. In addition, the distances from the outer triple and outer Doubledraht to Bull (107 or 170 mm), the distances from outer double to the opposite outer Double wire (340 mm) and the diameter of the wire (about 1.2 to 1.6 mm). The Softdart distinguishes between the 2-hole and the 3-hole dartboard. The size of the 2-hole dartboard corresponds to the specifications of the association and also to the standard of dart machines as they are used in public venues. The 3-hole dartboard gives the player a simpler double-in or double-out. These dartboards are often found as cheap deals in discounters or supermarkets. At first glance, the 3-hole dartboard seems more suitable for the beginner. This is where the first successes set in faster and their motivation is boosted. Darts, especially dart throwing, are about optimizing the following processes. This sequence must be coordinated in many exercises. This can be practiced on a 3-hole dart board as well as on a 2-hole dartboard. However, if you want to play more professional later, getting used to the required 2-hole dartboard is extremely difficult. The 2-hole Dartboard is therefore suitable as a home exercise pad for the ambitious player who wants to improve and train his skills for league or public play.